A Common Green Darner (?) recently emerged from its naiad larval casing. This morning in Huntington at 6:30AM it’s currently 59 degrees under partly cloudy skies. Winds are calm. Relative humidity is 99%, dewpoint 59, barometric pressure 30.05″ and steady. Yesterday’s high was 85 and the overnight low was 57. With high pressure in place over the region, we’ll enjoy mid-summer-like conditions today as warm, humid air continues to make its way into the region. It’ll be a warm-to-hot and muggy day today with mostly sunny skies and highs in the upper 80s to near 90 with southwest winds around 10 mph. A few isolated showers may pop up during the afternoon hours over higher elevations east. Tonight should be partly cloudy with isolated showers and thunderstorms. Lows will be in the lower 60s with southwest winds around 10 mph until midnight, becoming light and variable. Chance of rain is 20%. Saturday should be partly sunny with scattered showers and thunderstorms, mainly in the afternoon, as a slow moving cold front approaches from the Great Lakes. Highs will be in the mid 80s with south winds around 10 mph. Chance of rain is 40%. Saturday night should be partly cloudy with scattered showers and thunderstorms. Lows will be in the mid 60s with south winds around 10 mph. Chance of rain is 40%. The cold front should move into the region Sunday bringing numerous showers and thunderstorms. Some thunderstorms may produce gusty winds, small hail and heavy rainfall. Highs will be in the lower 80s with south winds 10 to 15 mph gusting up to 25 mph. Chance of rain is 70%. Sunday night showers are likely with a chance of thunderstorms. Lows will be in the upper 50s. Chance of rain is 70%. Last year on this date we had a high of 69 and a low of 45. The Moon is in its last quarter, 21d 10h old with 54% illumination. Chalk up another one to being in the right place at the right time. 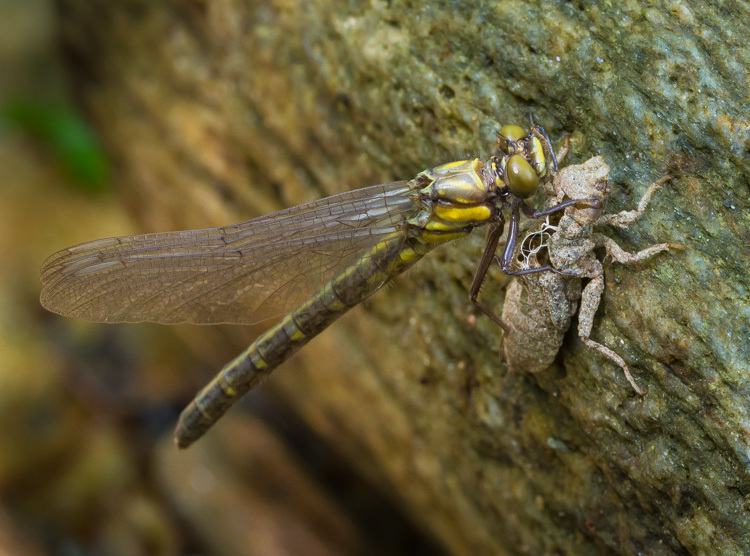 I was poking about in Fargo Brook with my new camera rig yesterday when I came across what I think is a Common Green Darner (Anax junius) that had recently emerged from its larval naiad case. It sat there very patiently as I took numerous shots from a variety of angles. This was the best view as it really shows both the dragonfly and the naiad case. It’s pretty amazing that something that big once fit inside something that small. The wonders of nature! I made the shot hand-held using my Sigma 105mm macro, ISO 500, f/14, 1/40″. 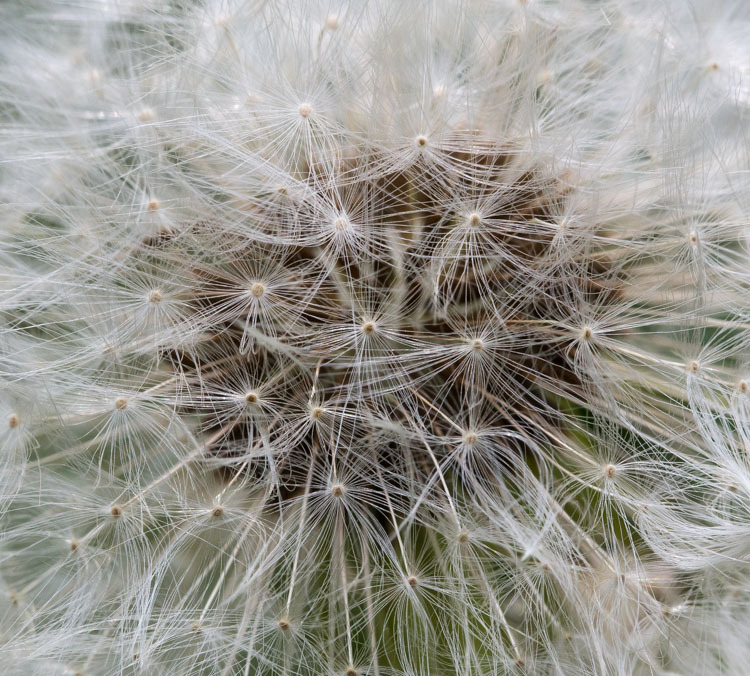 A dandelion seed head takes on geometric qualities when viewed up close. This morning in Huntington at 6:35AM it’s currently 56 degrees under a partly cloudy skies. Winds are calm. Relative humidity is 99%, dewpoint 56, barometric pressure 30.03″ and rising. We picked up 0.26″ of rain yesterday. Yesterday’s high was 69 and the overnight low was 51. High pressure will build into the region over the next few days along with warm, moist air bringing us summer-like conditions into the weekend. We’ll see partly sunny skies today with highs around 80 and west winds around 10 mph. Tonight should be mostly clear with patchy fog after midnight. Lows will be in the lower 60s with light and variable winds. Friday should be partly sunny with a slight chance of showers and thunderstorms in the afternoon as daytime convection interacts with some instability in the airmass. Highs will be in the mid 80s to near 90 with southwest winds around 10 mph. Chance of rain is 20%. Friday night should be partly cloudy with lows in the mid 60s and southwest winds around 10 mph. Saturday’s looking partly sunny with a chance of showers and thunderstorms in the afternoon as an upper level trough and attendant cold front approach from the Great Lakes. Highs will be in the mid 80s with south winds around 10 mph. Chance of rain is 50%. Saturday night should be partly cloudy with a chance of showers and thunderstorms. Lows will be in the mid 60s. Chance of rain is 50%. Last year on this date we had a high of 78 and a low of 55. We picked up 0.64″ of rain. Tomorrow will be 1m 25s longer. The Moon is waning gibbous, 20d 10h old with 65% illumination. I’ve got a new camera! After some five years with my trusty Nikon D90, I just upgraded to a new D600. This photo was the first shot I took with it. I’m sold! One of the things I love about macro (or, more accurately, micro) photography is what happens when you get in really close to an object. This shot was originally of the entire seed head. However, when I zoomed in close to check for focus, I discovered that the way the lacy “parachutes” intertwined reminded me of Buckminsterfullerene—a complex spherical molecule. I think the shot is much more interesting cropped in close. I took the shot using my Sigma 105mm macro, ISO 800, f/16, 1/200″. 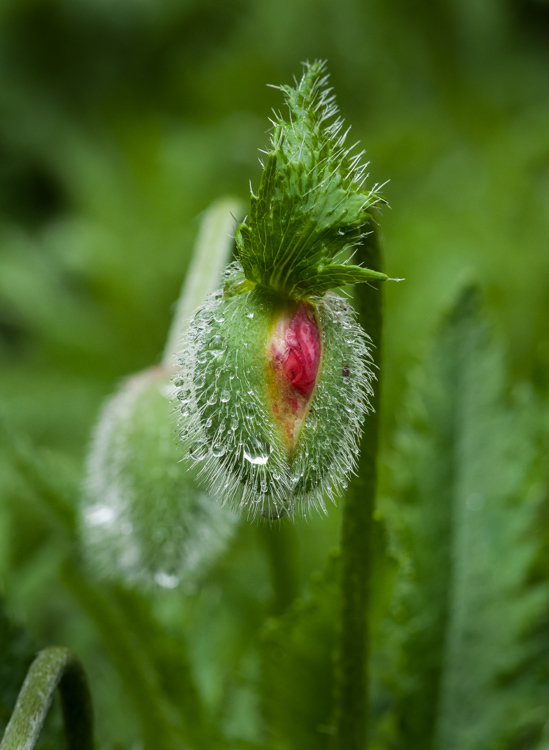 A rain soaked poppy bud just about to burst in our back garden. This morning in Huntington at 7:05AM it’s currently 55 degrees and raining lightly under overcast skies. Winds are calm. Relative humidity is 98%, dewpoint 54, barometric pressure 30.02″. We picked up 0.14″ of rain overnight. Yesterday’s high was 72 and the overnight low was 51. A warm front will push through the region today bringing showers with a slight chance of thunderstorms this morning, then occasional showers and thunderstorms this afternoon as a low pressure wave moves along the front. Some thunderstorms may produce damaging winds, hail and heavy rainfall this afternoon. Highs will be around 70 with south winds around 10 mph. Chance of rain is 80%. Tonight should be mostly cloudy with showers and thunderstorms likely until midnight, then become partly cloudy with a chance of showers and a slight chance of thunderstorms after midnight. Lows will be in the upper 50s with southwest winds around 10 mph. Chance of rain is 70%. By Thursday the region will be enveloped in a summerlike airmass courtesy of a building Bermuda high that will swing warm humid air northward into the weekend. We’ll see partly sunny skies with a slight chance of showers and thunderstorms over higher terrain in the afternoon as diurnal heating kicks in. It’ll be warmer with highs in the lower 80s and west winds around 10 mph. Chance of rain is 20%. Thursday night should be mostly clear with lows around 60 and southwest winds around 10 mph. Friday’s looking partly sunny and warmer still with highs in the mid 80s and southwest winds 10 to 15 mph. Friday night should be partly cloudy with lows in the lower 60s. Last year on this date we had a high of 88 and a low of 62. We picked up 0.04″ of rain. Burlington norms for this date are highs of 71°F and lows of 50°F. Tomorrow will be 1m 29s longer. The Moon is waning gibbous, 19d 19h old with 75% illumination. We have many “volunteer” poppies growing in one of our backyard flowerbeds. This one is just cracking open to unfurl its crinkly petals (I’m sure there will be a shot of that down the road!) I like the bright splash of red against all the green. I took this shot hand-held with my 105mm macro, ISO 500, f/13, 1/250″. Snow on Mt. Mansfield yesterday afternoon as viewed from Pond Road in Richmond. This morning in Huntington at 7:10AM it’s currently 41 degrees under clear skies. Winds are calm. Relative humidity is 98%, dewpoint 40, barometric pressure 30.21″ and rising. Yesterday’s high was 65 and the overnight low was 35. The high pressure that gave us yesterday’s sunshine is currently moving off the coast. We’ll see sunny during most of the day today with highs in the lower 70s and light and variable winds, becoming southerly around 10 mph this afternoon. Clouds will begin to filter in this afternoon out ahead of a warm front approaching from the southwest. Tonight should be partly cloudy until midnight, then become cloudy with a chance of showers and a slight chance of thunderstorms after midnight. Lows will be in the mid 50s with south winds around 10 mph. Chance of rain is 50%. Wednesday showers are likely with a slight chance of thunderstorms in the morning, then occasional showers and thunderstorms in the afternoon. Some thunderstorms may produce gusty winds, small hail and heavy rainfall in the afternoon, and there’s the possibility of some “training” storms similar to those that impacted the region during our last round of thunderstorms. These are storms that act like cars on a train that hit the same region in succession. Highs Wednesday will be in the upper 60s to low 70s with south winds around 10 mph in the morning, becoming light and variable. Chance of rain is 80%. Wednesday night should be cloudy with a chance of showers and thunderstorms. Some thunderstorms may produce gusty winds, small hail and heavy rainfall. Lows will be in the lower 60s with light and variable winds. Chance of rain is 50%. Thursday’s looking partly sunny and warmer as we’ll be fully enveloped in moist tropical air for remainder of the week. Highs will be in the lower 80s with light and variable winds. Thursday night should be partly cloudy with lows in the mid 60s. Last year on this date we had a high of 83 and a low of 48. Burlington norms for this date are highs of 71°F and lows of 49°F. The Moon is waning gibbous, 18d 11h old with 84% illumination. Saturday night’s surprise snowfall was quite dramatic. Mt. 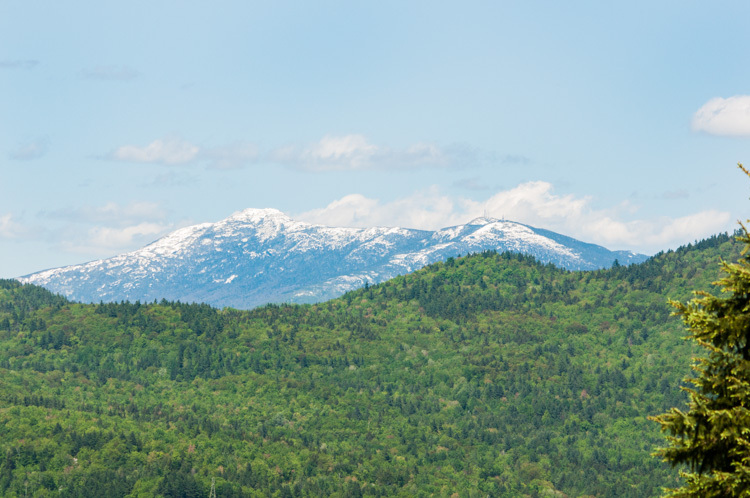 Mansfield picked up 13″ at the summit and Whiteface in the Adirondacks picked up a whopping 34″! Luckily, the snow level didn’t reach much below 2500′ where trees are fully leafed out. This shot was taken with my 150-500mm zoom at 150mm, ISO 400, f/8, 1/1000″. Huntington Gorge running high yesterday afternoon. This morning in Huntington at 6:30AM it’s currently a chilly 34 degrees under clear skies (whaaat?). Winds are calm. Relative humidity is 99%, dewpoint 34, barometric pressure 30.13″ and rising. We picked up 0.13″ of rain in the past 24hrs. Yesterday’s high was 47 and the overnight low was 33. Total rainfall since Friday from the storm here is 3.65″. Add to that the daily thunderstorms and showers that started on the 20th and we’ve had a total of 6.13″ since last Tuesday. We are pretty sodden. We will enjoy sunny skies and much warmer temperatures today courtesy of high pressure currently building into the region. Highs today will be in the mid 60s with west winds around 10 mph gusting up to 25 mph and becoming northwesterly this afternoon. Tonight should be clear with patchy frost after midnight. Lows will be in the mid 30s with some possible areas of frost in true cold pockets. Winds will be out of the northwest at around 10 mph until midnight, becoming light and variable. Tuesday should be sunny and warmer still with highs in the lower 70s and light and variable winds becoming southerly around 10 mph in the afternoon. A broad warm front will approach the region from the southwest Tuesday night bringing partly cloudy skies with a 40% chance of showers. Lows will be in the mid 50s with south winds around 10 mph. The warm front will move into the region Wednesday bringing mostly cloudy and a 50% chance of showers. Highs will be in the upper 70s to near 80 with south winds 10 to 15 mph. Wednesday night should be mostly cloudy with a chance of showers and thunderstorms. Lows will be in the upper 50s. Chance of rain is 50%. Looking down the road, we’ll see increasing heat and humidity as a Bermuda high sets up and aids in the funneling of warm humid air up the east coast and into our region. It’ll feel like mid summer by the middle of the week with muggy conditions right into the weekend. Last year on this date we had a high of 76 and a low of 46. The Moon is waning gibbous, 17d 10h old with 92% illumination. The notorious and picturesque Huntington Gorge is a great place to take pictures, especially when the water is high. With all the rain we’ve had over the past many days (and it seems like many many…) I knew the water would be roaring through the limestone channel. With rain-slicked rocks, moving around above the cataract was a bit tricky, and the continuing rain and wind made shooting a challenge. Worth it though I think! I took the shot hand-held using my Nikon 18-105mm zoom @ 18mm, ISO 100, f/14, 1/8″ shutter. One of the best things about the newer optical stabilization lenses is that you can shoot hand-held without a tripod down to 1/8″ if you’re steady. This shot is a good example. 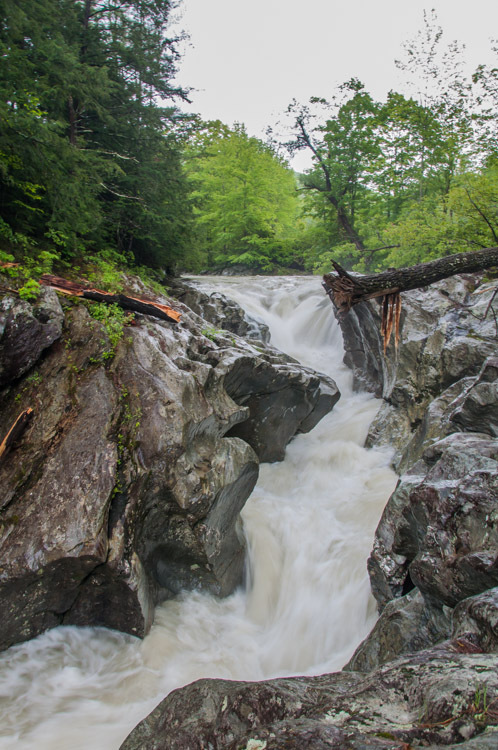 I was able to get the flow of the water nicely without the hassle of setting up a tripod on the slick rocks. Of course, a 2″-4″ exposure might have been a tad better–smoothing out the water even more–but I’m happy with this shot all things considered. White Pine “candles” in the afternoon light. This morning in Huntington at 9:30AM it’s currently a raw 41 degrees and still raining under overcast skies. Winds are out of the south at 0-3 mph. Relative humidity is 96%, dewpoint 40, barometric pressure 29.91″ and rising slowly. We picked up 1.48″ of rain in the past 24hrs. Yesterday’s high was 44 and the overnight low was 36. A Flood Watch remains in effect for our region until 10:30AM this morning, especially for areas just to our north along the Lamoille River in Jeffersonville and portions of Jericho that were hit hard just a few days ago. Watch out for high water! We’ve got another chilly, rainy day on tap today as the coastal low continues to pump cold moist air into the region. We’ll see rain this morning tapering to showers this afternoon. Highs will only be in the upper 40s with northwest winds 15 to 20 mph gusting up to 30 mph. Chance of rain near is 100%. Tonight will be partly cloudy with a chance of showers until midnight, then clearing after midnight as the low finally moves off to northeast and high pressure begins to build into the region from the northwest. Lows will be in the upper 30s with west winds 10 to 15 mph gusting up to 25 mph until midnight, becoming light and variable in the early morning hours. Chance of rain is 40%. We can expect another 0.50″ to 0.75″ of rain out of this storm before the spigot finally shuts off overnight. There is the possibility of frost early Monday morning. High pressure will move into the region Memorial Day bringing sunny and moderating temperatures. Highs should be in the lower 60s by later in the day with northwest winds 10 to 15 mph gusting up to 25 mph. Monday night should be clear with lows around 40 and southwest winds around 10 mph. Tuesday’s looking sunny with highs in the lower 70s and south winds around 10 mph. Tuesday night should be mostly clear with lows in the lower 50s. Things are looking more “normal” going forward into the middle of the week. Last year on this date we had a high of 71 and a low of 53. We picked up 0.67″ of rain. Burlington norms for this date are highs of 70°F and lows of 49°F. The Moon is waning gibbous, 16d 13h old with 97% illumination. I’ve always enjoyed the term “candle” when referring to the new growth of white pine trees. 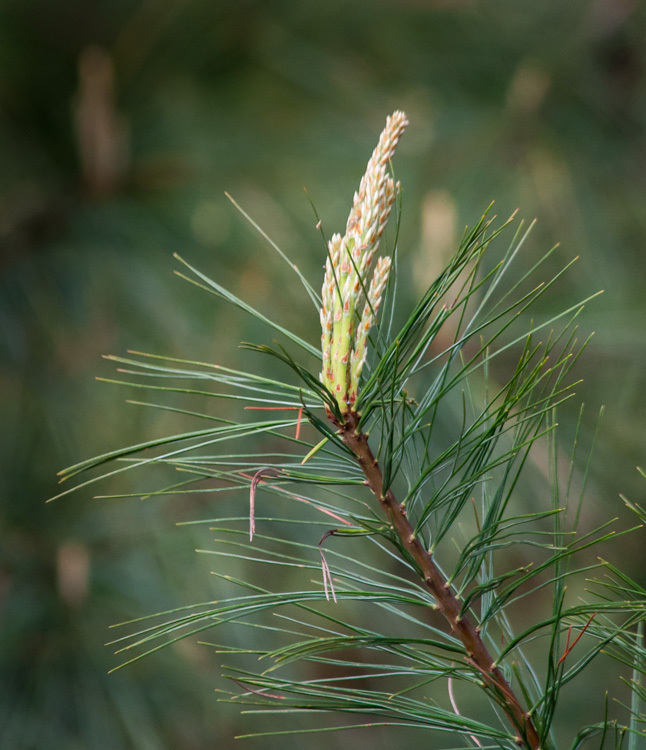 The way the pale green pops out against the darker green of the pine’s mature needles is indeed reminiscent of candles burning. This shot was taken with my 55-300mm telephoto @ 270mm, ISO 1250, f/8, 1/50″. Sunset colors over our front field last Wednesday evening. This morning in Huntington at 6:25AM it’s currently a soggy 42 degrees and raining under overcast skies. Winds are out of the south at 1-4 mph. Relative humidity is 95%, dewpoint 40, barometric pressure 29.95″. We picked up 1.31″ of rain in the past 24hrs. Yesterday’s high was 50 and the overnight low was 41. There is a Flood Watch in effect for our region until Sunday afternoon. We’ll be under the gun of a deep trough of coastal low pressure–a May nor’easter–for another 24 to 36 hours. The low will continue to rotate moisture and chilly air off the Gulf of Maine and into our region. Today we’ll see rain with highs only in the lower 40s and north winds 15 to 20 mph. Chance of rain is near 100%. Rain will continue unabated into tonight with the likelihood of snow above 2000′. Expect little or no snow accumulation at more residential elevations, however mountain summits could see as much as 6″ of heavy snow. Overnight lows will be in the upper 30s with northwest winds 15 to 20 mph. Chance of precipitation is near 100%. Rain will continue into Sunday morning, then slowly taper off to showers in the afternoon as the low moves off the coast. Highs will be in the upper 40s with northwest winds 15 to 20 mph. Chance of rain is near 100%. Sunday night should be partly cloudy with a 40% chance of showers. Lows will be in the upper 30s with west winds around 10 mph. We can expect at least another 1.5″-2″ of rain out of this storm before it’s all done, with as much as 3″ possible along the western slopes of the Greens. High pressure will build in for Memorial Day bringing mostly sunny skies with highs in the mid 60s and northwest winds 10 to 15 mph gusting up to 25 mph. Monday night should be clear with lows in the upper 30s. Last year on this date we had a high of 77 and a low of 62. Burlington norms for this date are highs of 70°F and lows of 48°F. Other names for this full moon include: “Milk” (Colonial American & English), “Bright” (Celtic), “Hare” (Medieval Wiccan), and “Grass” (Neo Pagan Wiccan). There’s a lovely planetary conjunction occurring in the western sky after sunset over the next several days. The planets Mercury, Jupiter and Venus will be clustered close to each other on the western horizon shortly after sunset from now until the 29th. A good time to check will be Monday night at around 9:00PM, and you’ll need a clear shot to the western horizon as they’ll be quite low in the sky. Good luck! 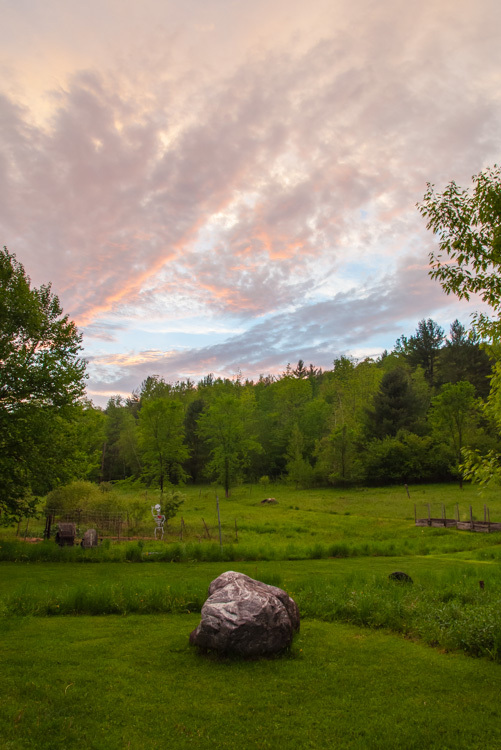 This photo was taken last Wednesday evening out in our front yard as we got a break in the clouds between thunderstorms and showers. The now sodden volleyball court, lower garden and our new scare-skeleton (thanks Gary!) can be seen. I really like the richness and variety of the greens and detail in the sky. We live in a lovely place! I took the shot using my 18-105mm zoom @ 18mm, ISO 800, f/11, 1/30 shutter, and a polarizing filter. I tweaked it a bit in Lightroom to balance out the darker foreground and draw some more saturated color out of the sky. Lightroom is an amazing tool allowing for near HDR (high dynamic range) photography from a single shot.